Having hip replacement usually requires a hospital stay of 3 to 5 days. During that time you will have the surgery and begin recovery and rehabilitation. You will also learn about possible complications, including how to prevent them and recognize them if they occur. You will most likely be admitted to the hospital on the day of your surgery. Before you are admitted, however, you will see an anesthesiologist, who will evaluate your general health and talk with you about the types of anesthesia, or pain relief, during surgery. Two common types of anesthesia for hip replacement are general anesthesia and spinal or epidural anesthesia. With general anesthesia, you are asleep during surgery and a machine helps you breathe. With spinal or epidural anesthesia, you are numbed from the waist down during the operation. Regardless of the method used, the surgery itself will not be painful. 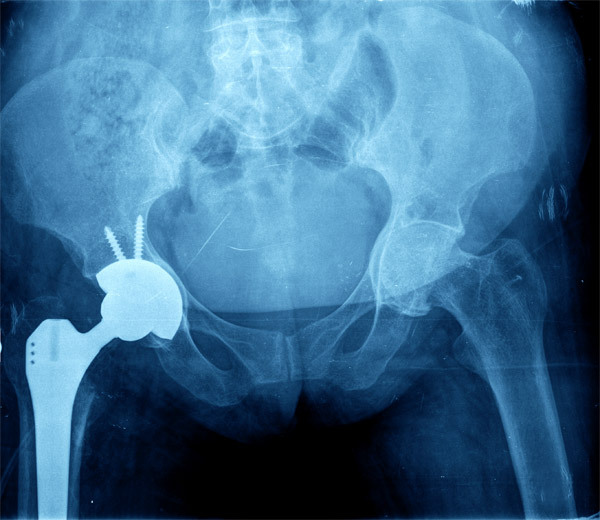 Hip replacement surgery usually takes 1 to 2 hours. After surgery, you will be taken to the recovery room where you will be monitored for an hour or two. Once you are fully awake and alert, you will be moved to a hospital room for the rest of your stay. In the first hours after your surgery, you will be allowed to move very little. Your hospital bed will have special pillows or devices to hold your hip in the correct position. You may have an IV tube inserted to replace any fluids you lost during surgery. You may also have a tube near the incision to drain fluid and a tube called a catheter to drain urine until you are able to go to the bathroom. You will also receive medicine to relieve pain. The surgery site will be closed with staples or stitches, which will be removed about two weeks after surgery. In the meantime, it will be important to avoid getting the wound wet until it heals. A bandage can help prevent clothing or stockings from irritating the wound. Shortly after surgery, a respiratory therapist may visit you and ask you to breathe deeply, cough, or blow into a device to increase your lung capacity. Doing these things will help reduce the risk of infection in your lungs. Later in the day after your surgery or the following day, physical therapists will begin to teach you exercises to help your recovery. A day or two after surgery, you will be allowed to sit on the edge of the bed and stand and walk with help.